The I Want Chocolate Cake Cake: For when you need a low maintenance single-layer, naked-sided, made in a square brownie pan kind of cake to stuff in your mouth after a week (or day?) of pure torture. It seems like ages since I’ve made a cake and I won’t lie to you when I say that I’ve been daydreaming about cake day in and day out for weeks. I’m wish I were kidding. It’s a good thing I work in an office because if I were home every day, there would be trouble. On the other hand, this blog would get updated more often than it does now so there’s that. But back to the cake. I really wanted chocolate cake. And you know what? This is the cake for when I want chocolate cake. I’ve talked about other easy cakes before like this I want cake at 7pm on a Tuesday night cake and this hey! I don’t even need a bowl to make this cake cake and the ever-perfect everyday chocolate loaf cake but this one is a little different. 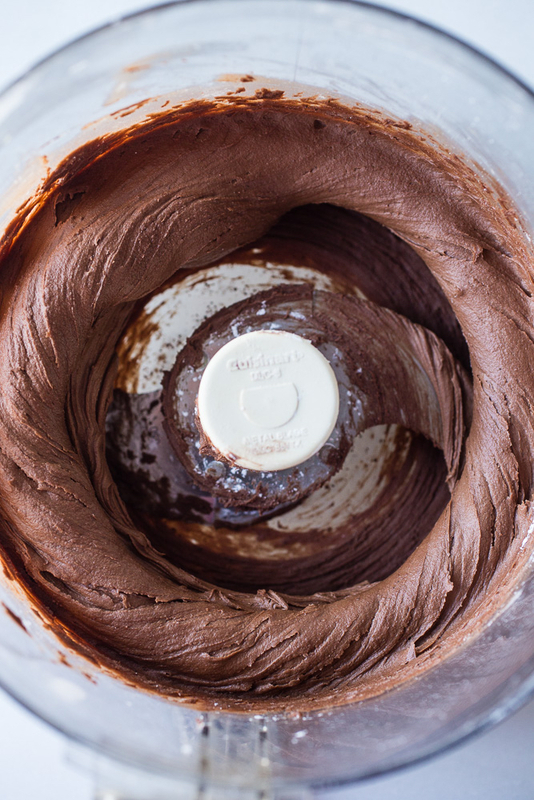 It mostly has to do with the fact that the creamiest and fluffiest of chocolate buttercream frostings gets whipped around in a food processor. Yep. 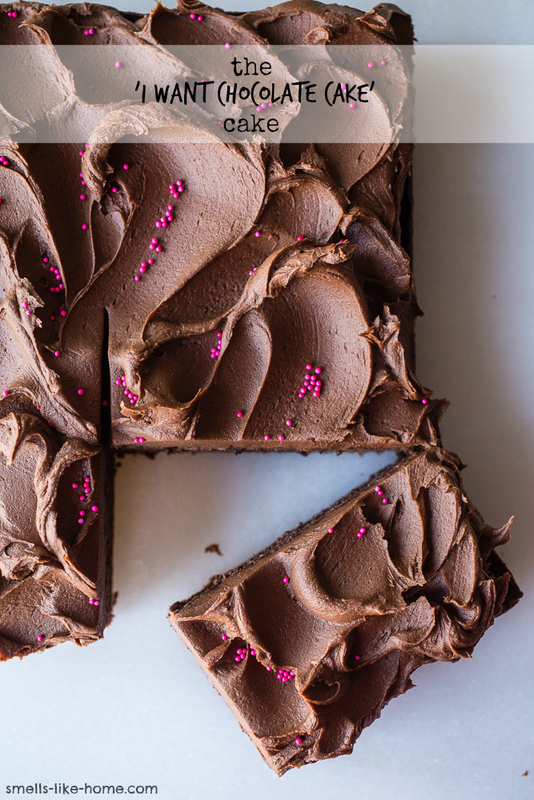 But also that it’s a low maintenance single-layer, naked-sided, made in a square brownie pan kind of cake. That luscious frosting is just plopped on top straight from the food processor and swirled around to your heart’s content. Sprinkles aren’t necessary but they sure are pretty. And the cake itself? 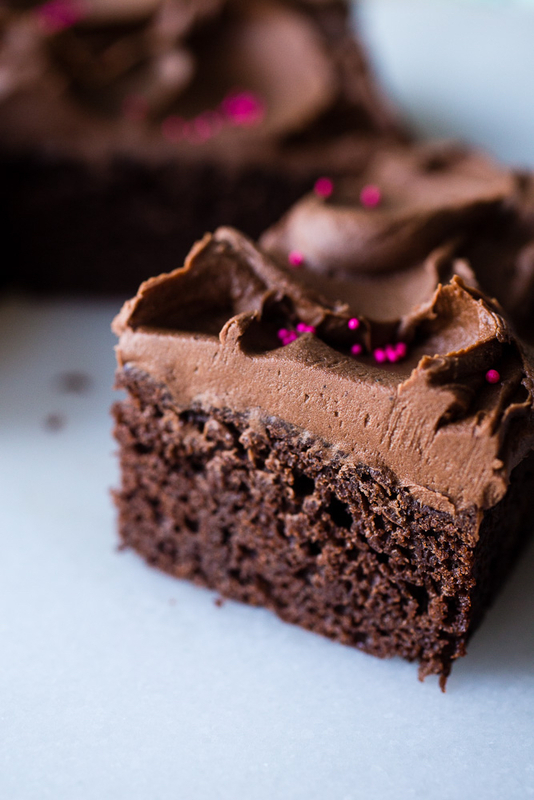 Soft, intensely chocolatey, and irresistible, especially with all that billowy chocolate frosting happening on top. I think I feel another one coming on today because after this past week, I want chocolate cake. To make the cake: Preheat oven to 350° F. Line an 8-inch square pan with parchment paper and grease the paper and sides of the pan with baking spray; set aside. Sift the cocoa powder, flour, baking soda, baking powder, and salt together into a large bowl; set aside. In the bowl of a stand mixer fitted with the paddle attachment (or in a mixing bowl with a hand mixer), beat the butter and sugars together at medium-high speed until fluffy, about 2-3 minutes. Add the egg and yolk and beat until just combined. Scrape down the bowl. Mix the vanilla into the buttermilk. Starting and ending with the buttermilk, in three additions, mix in the buttermilk and dry ingredients until just combined (½ buttermilk-all dry-½ buttermilk). Scrape down the bowl again and give the batter a couple of good stirs to ensure everything is combined. The batter may be lumpy and that's ok. Pour the batter into the prepared baking pan and spread it into an even layer. Bake for 25 to 35 minutes (dark pans need the lower amount) until a toothpick inserted into the center of pan comes out clean. Transfer the pan to a wire rack and cool for 10 minutes before inverting the cake from the pan onto the rack to cool completely. To make the frosting: Add all of the frosting ingredients to the food processor and process just until the frosting is light and fluffy, scraping down the sides of the bowl as needed. The frosting sets up pretty quickly so you'll want to frost the cake immediately or cover the bowl tightly until you're ready to use. When you're ready to serve, cut into squares. Keep leftovers (ha!) tightly covered at room temperature for up to 2 days or in the fridge for up to a week if you like your cake cold. In the bowl of a stand mixer fitted with the paddle attachment (or in a mixing bowl with a hand mixer), beat the butter and sugars together at medium-high speed until fluffy, about 2-3 minutes. Add the egg and yolk and beat until just combined. Scrape down the bowl. Mix the vanilla into the buttermilk. Starting and ending with the buttermilk, in three additions, mix in the buttermilk and dry ingredients until just combined (½ buttermilk-all dry-½ buttermilk). Scrape down the bowl again and give the batter a couple of good stirs to ensure everything is combined. The batter may be lumpy and that’s ok. Pour the batter into the prepared baking pan and spread it into an even layer. To make the frosting: Add all of the frosting ingredients to the food processor and process just until the frosting is light and fluffy, scraping down the sides of the bowl as needed. The frosting sets up pretty quickly so you’ll want to frost the cake immediately or cover the bowl tightly until you’re ready to use. When you’re ready to serve, cut into squares. Keep leftovers (ha!) tightly covered at room temperature for up to 2 days or in the fridge for up to a week if you like your cake cold. how ever did you know that I wanted chocolate cake ;P Seriously this is so simple yet beeeautiful and looks delectable! Oh honey. Oh baby. oh YES. Thanks, Jane! It’s definitely a big favorite around here!